New Caledonian crows understand ow to displace water to receive a reward, with the causal understanding level of a 5-7 year-old child, according to results published March 26, 2014, in the open access journal PLOS ONE. Just a few days ago, we were presenting a study which showed that goats are smarter than previously believed, and now, it’s the birds’ turn. Understanding causal relationships between actions is a key feature of human cognition – until a few decades ago, most researchers thought this was only reserved for humans, or at the very most, humans an a few other primates. But we’ve been proven wrong. In order to test the crows, scientists used Aesop’s famous fable riddle – in which participants have an out-of-reach reward floating on water, and have to bring it up somehow. The solution is to drop stones in water, raising the water level until the reward is in reach. They set out to test New Caledonian crows, which are known for their intelligence and innovation – they are the only non-primate animals known to develop tools such as prodding sticks and hooks. Six wild crows were tested after a brief training period for six experiments; the tests they were subjected to… children aged 5-7 would solve all or most of them. In each experiment birds dropped objects into tubes to obtain an out of reach food reward. Each experiment involved either a choice of two tubes or a choice of two objects. The apparatus was presented on a table in the centre of a large testing cage, as pictured. 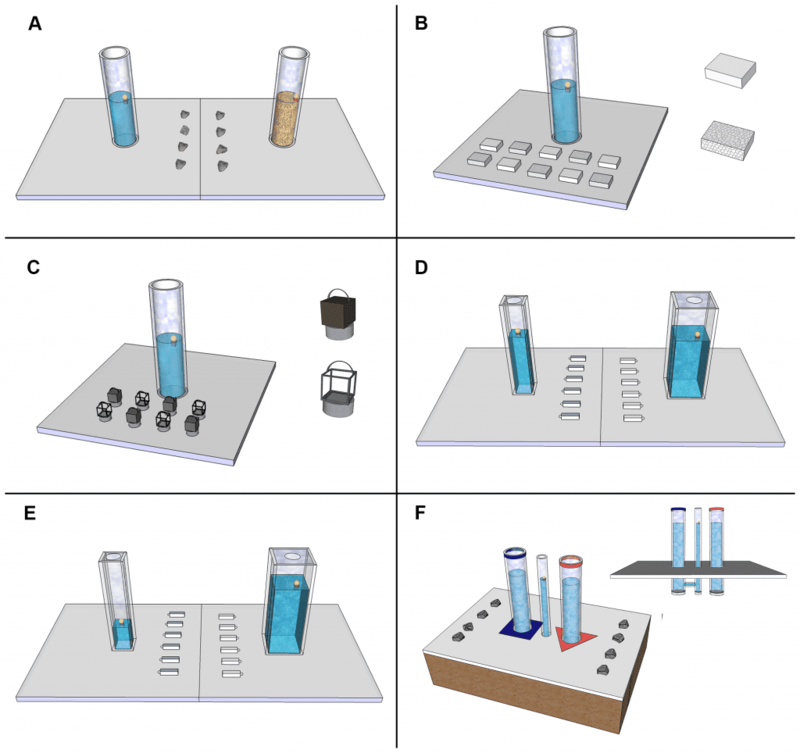 A: Experiment 1, Sand-filled tubes v Water-filled tubes, B: Experiment 2, Sinking v Floating objects, C: Experiment 3, Solid v Hollow objects, D: Experiment 4, Narrow v Wide tubes, E: Experiment 5, High v Low water levels in Narrow and Wide tubes, F: Experiment 6, U-tube, a concealed connection links one of the outer tubes with the rewarded central tube. Crows completed 4 of 6 water displacement tasks, including “preferentially dropping stones into a water-filled tube instead of a sand-filled tube, dropping sinking objects rather than floating objects, using solid objects rather than hollow objects, and dropping objects into a tube with a high water level rather than a low one“. They did, however, fail on the 2 most complex tasks, which involved understanding of the width of the tube and the counterintuitive cues for a U-shaped displacement task. 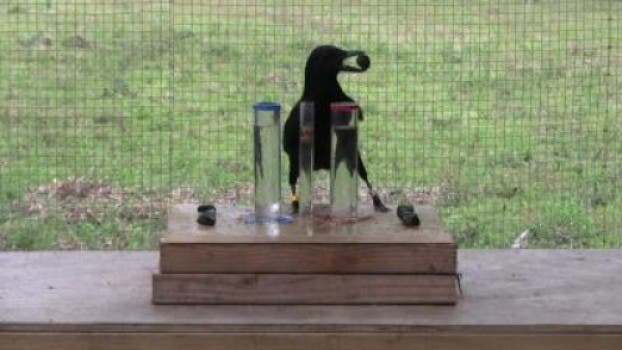 According to researchers, results show that the crows possess a sophisticated — but incomplete — understanding of the causal properties of volume displacement. In other words, they’re as smart as 5-7 year old children – just not as smart as the brightest ones. This is yet another proof that we need to reevaluate what we think about animal intelligence. In the earlier stages of science, we thought that intelligence is what separates humans from animals. Then, we started to understand that other animals, most notably primates think much like us. Then we figured out that dolphins are incredibly smart, that elephants can cooperate, and now we’re moving beyond mammals. Animals are intelligent, on many different levels – and it’s high time we accepted that.